#FireballsInTheSky: Did you know that #meteorites are the oldest rocks in existence and the only surviving physical record of the formation and evolution of the solar system. Potentially, meteorites offer a way for us to understand our origins and to decode that information we need to know where they come from. The Desert Fireball Network (or DFN for short) is designed to provide that data. Fireballs in the Sky is a citizen science initiative that allows everyone to share the discoveries of the ... See More Desert Fireball Network. 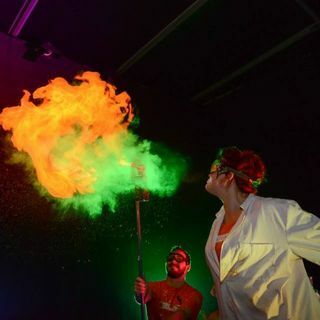 To find out more Leah and Miani crossed to Perth for National Science Week to speak with Science Communicator, Renae Sayers from Curtin University, about the Fireballs in the Sky project. Renae has a degree in astrophysics and gets to talk about science all the time including at TEDxPerth, presentations at the Australian Academy of Science and Global Health Conference 2015, as well as a sell-out Fringe World show, which is all pretty impressive! Through her Planetary Science Outreach role at Curtin, Renae shares the stories of the Desert Fireball Network seeking the origins of our solar system and grows the Australian Planetary Science community with NASA through the Solar System Exploration Research Virtual Institute.... oh, and Renae also breathes fire too!